It’s late September on a Saturday morning, the kind that brings back the perfection of all prior falls’ delicate balance of warmth being stilled by incoming currents of cooler air, the clarity of light as we shift away from the Sun, tree leaves only beginning to unveil yellow. We’ve just passed the Equinox. It’s just barely warm enough for t-shirts alone. The day is exquisitely autumnal, and like every fall I’ve ever known it bears down through the senses some new inspiration. Change is afoot, and it feels very much like it’s going to be good. I’ve made it to the Toolbox on Civic Plaza Drive, Taos’ own makerspace where exceptional ideas have been born and manifested. There is coffee and plum cake that Joaquin Karcher has made, and he is serving it to at least 25 people who are here for a free Zero Energy Home Tour. I recognize some of the people here as builders, some from the earthship community, artists, teachers, locals. Joaquin, a German architect who has lived in the U.S. since 1991, is the owner of Zero E Design and in the past he has brought people to view homes informally. 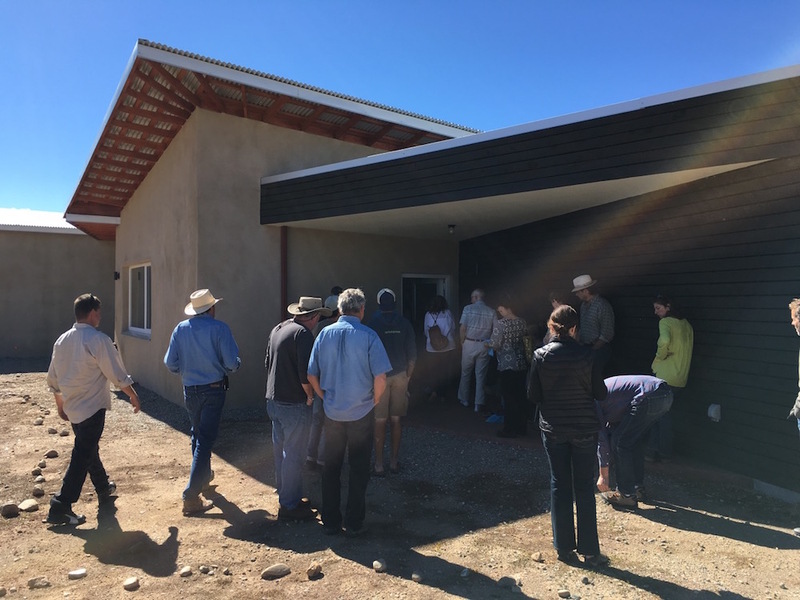 Today’s walking tour is his first organized showing of the Zero Energy architecture he’s been incorporating for ten years. The tour begins with a slideshow presentation inside the Toolbox. Joaquin gives an overview of his education and background in pursuit of energy-efficient building, first in Germany, and then in Iran and the U.S. He explains how as a student in Germany in the 1980s, the most interesting architecture in eco design was being created in the Desert Southwest. “What was going on here was outstanding,” he says. At the forefront of the Passive Solar/Adobe Movement was Ed Mazria, who wrote The Passive Solar Energy Book in 1979. In addition to him, leaders of the movement were Doug Balcomb, who was responsible for the science of Passive Solar, Steve Bear for innovations in mechanical engineering, and Mike Reynolds for off-the-grid living. Ed Mazria determined that buildings consume 48% of energy production and that to reduce CO2 emissions architects would have to take the lead. He later abandoned Passive Solar and founded ARCHITECTURE 2030, issuing the challenge to end the burning of fossil fuels to energize buildings by the year 2030, which would mean no boilers, no waterheaters, no open flame. At the same time, NASA Scientist, James Hanson was repeatedly testifying before Congress about the impending Tipping Points of climate change, and the need to make global changes immediately. Joaquin is clear and easy to follow with a soft accent that delivers his delight for the very real capabilities and benefits of zero energy technology. 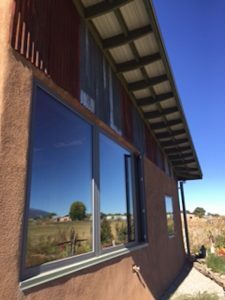 After the presentation, we set off from the Toolbox to see three of the approximately ten homes Zero E Design has built in Taos and Santa Fe. 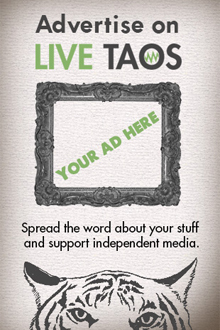 These three are all within a few minutes of downtown Taos. Inside the first home we visit, people ask Joaquin about building and technology, while others meander the gardens and greenhouse. I’m drawn to the graceful and efficient geometry of the design. The rooms feel open in what are actually small spaces–like in the kitchen, where the straight and curved lines of its walls and cabinetry reflect Taos Mountain through the window. This mimicking of geography psychologically feels natural and expanded, and like you’re part of the mountain. The house is both minimalist and adobe. The integrity of the architecture, from the integration with the landscape, to respect for the environment and the efficiency and warmth in the design, looks like art that expresses the very concept of the technology. 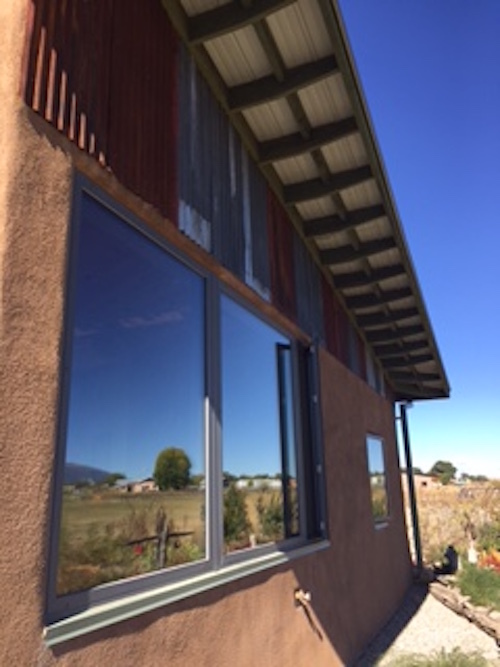 And, construction costs are competitive with the costs of otherwise typical construction in Taos. Sometimes less. We visit two more homes before noon. They are equally beautiful. At the end of the tour it’s now warm enough for just the t-shirt, and I’m once again feeling excited by the possibilities in Taos.